Today something momentous happened. I got my legs out. It's not that I mind ditching the tights, in fact I prefer it, but usually the great british weather prevents such things. But now the sun has decided to shine, the only issue is the sun deprived shade of my skin and that's where our friend fake tan comes in. I've tried my fair share of tans from mouse, to gel, to cream and there's always some kind of issue- it takes too long to develop, it goes patchy, you become a digestive smelling oopma loopma... throughout all these mishaps all I always wanted was a tan to keep me glowy and gorgeous without the hastle and I'm pleased to report Dove Summer Glow is just that! For a start it comes in at only £4.99 so keeping stocked up is no problem (in fact I'd go and grab a few bottles from Boots while it's on half price in at a tiny £2.49!) and it also acts as a nourishing moisturiser so you can cut down on all your lotions and potions. 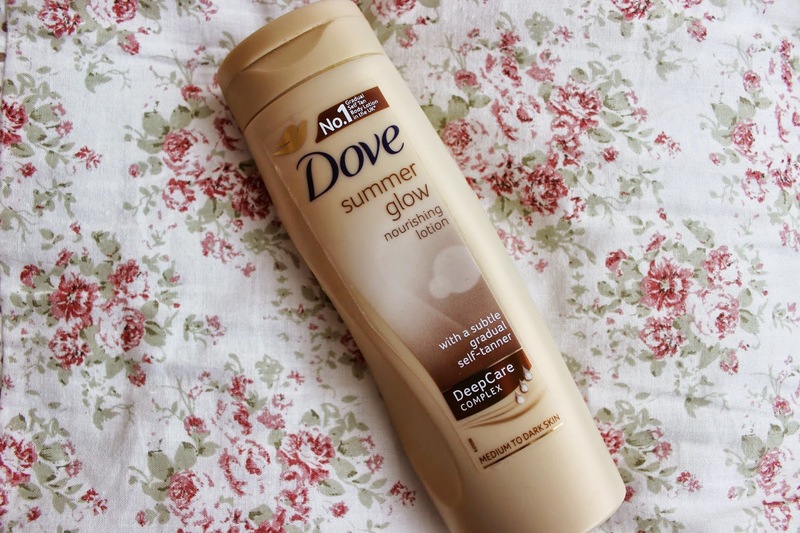 To keep my tan topped up I apply this every few days with a mitt (absolute top trick for foolproof application) either before bed or after my morning shower and actually enjoy the fresh summery smell and don't feel self concious walking around in it all day- it's a miracle! For a white gradual tanning lotion this has a really good colour pay off that you can use more sparingly as a natural skin kissed perk up or apply more often for a summer/night out look. I would recommend getting the medium to dark skin shade even if you're fair though, as it'll only fast track your tan and the olive undertone will keep you from getting tangoed. You'll also find it's not too tacky, fades evenly and is gentle enough to use as a face tanner. I mean really, do you need any more reasons to get up and glow? I actually managed to pick up a bit of a natural tan at the weekend when me and Rosie spent our Sunday having a lovely picnic in St.James's Park. We may also have decided at about 6.15pm that we wanted an impromptu trip to Space NK and proceeded to tube/run there... that seven minutes amongst the makeup and skincare was so worth it. Talking of skincare I had the most amazing evening with bloggy babes to celebrate the Benefit b.right range last night at RoseWood London, so if you haven't given that a go yet it may be the perfect pairing to your new bronzed beach babe complexion! What's your favourite way to fake it? I am so lazy with fake tan so this sounds righttt up my street! I will definitely have to give it a go!